A big thanks goes out to Andrea from AAHOM, and also to our friends at the Ontonagon Theater of Performing Arts for letting us hold the workshops in their fancy Chandelier Room! 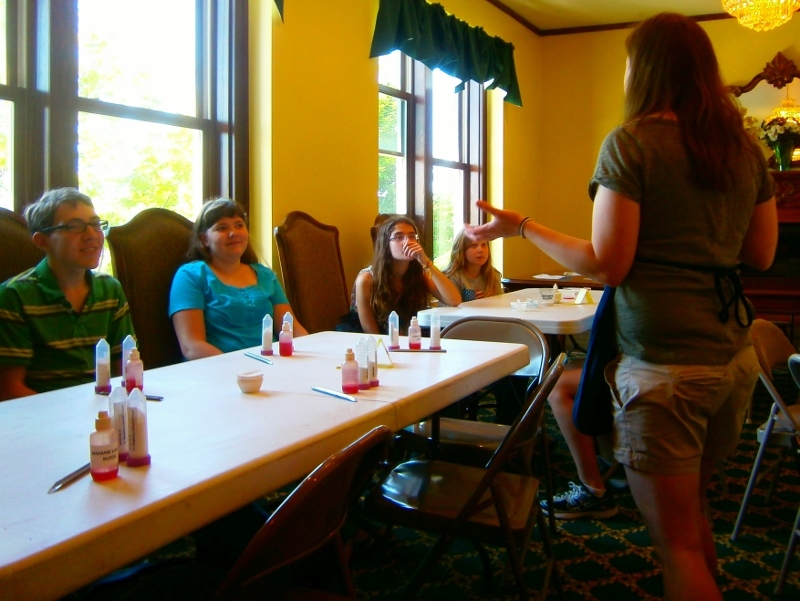 It was a perfect setting for the "Crime Lab" mystery that the older kids solved! 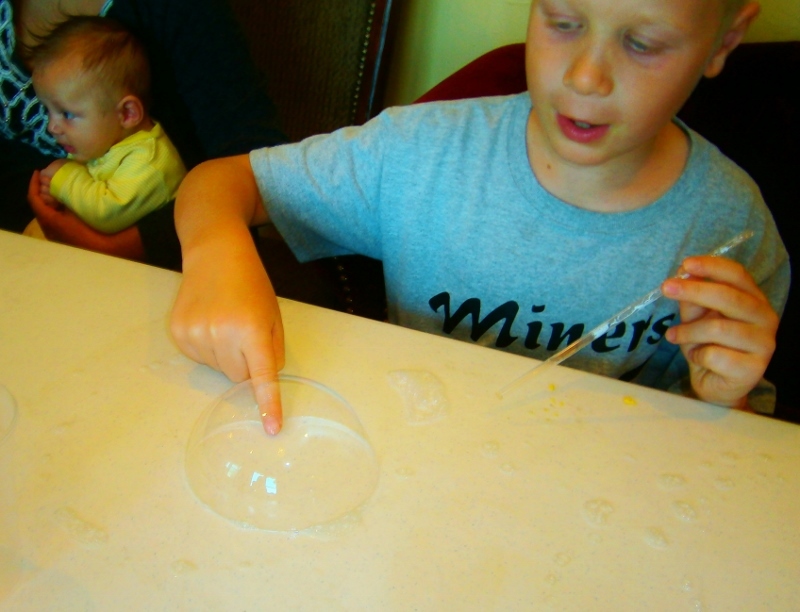 Pictures from our 2015 Summer Reading Program's special Science Day with the Ann Arbor Hands-On Museum! 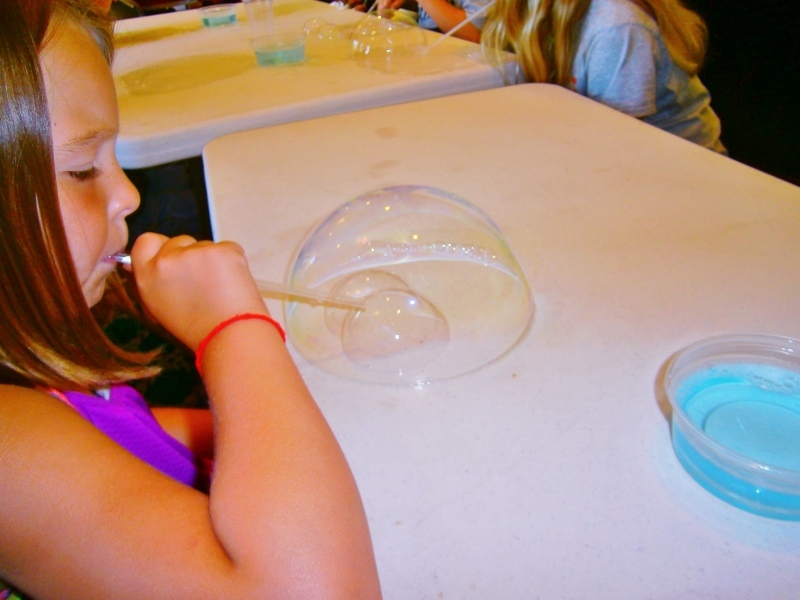 Bubbles inside bubbles inside bubbles! 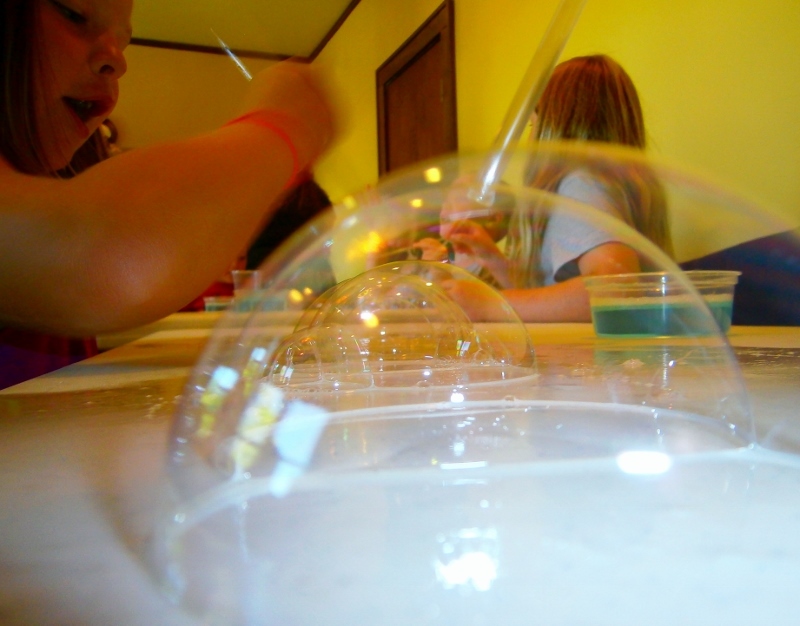 We learned that bubbles like to stick together! Including parents, we had about 40 people show up for our Science Day! 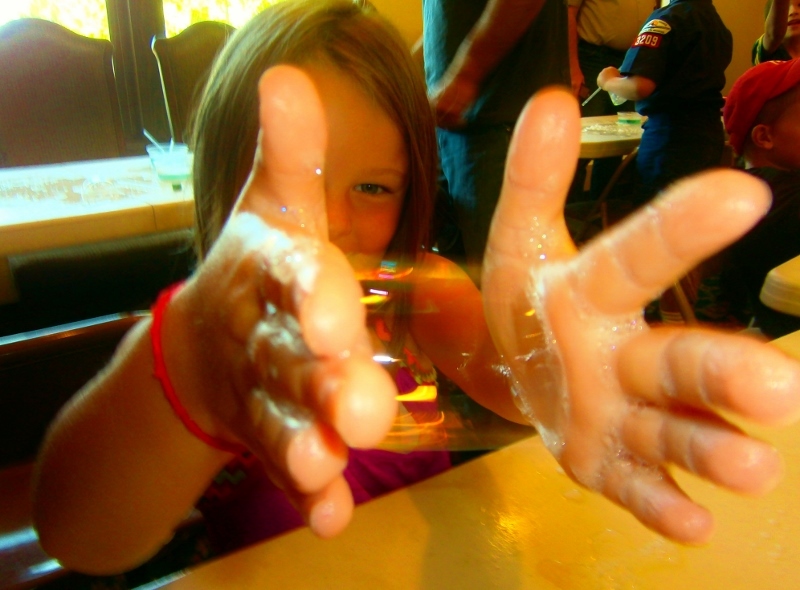 Looking through these bubbles is, like, a metaphor for life, man. Wait--nobody told me we had powerful sorcerers coming to Science Day! 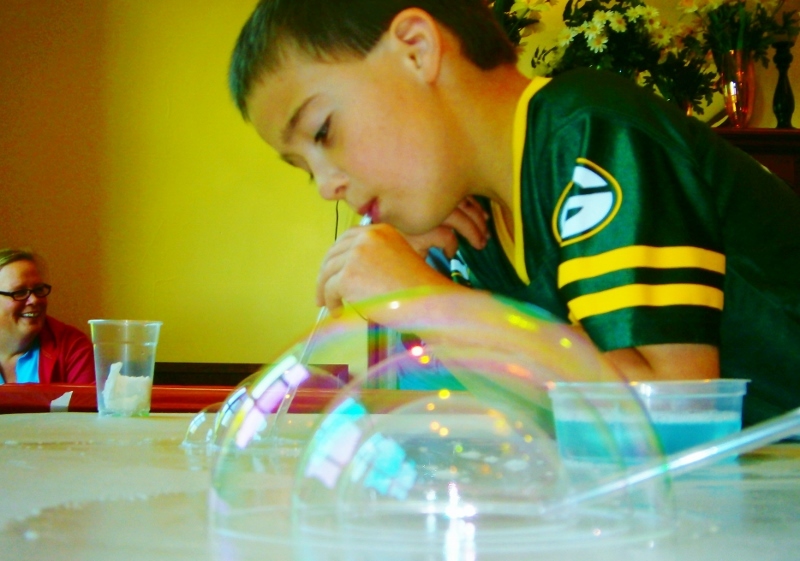 He can put his finger inside the bubble without even popping it?! Science... or MAGIC? Everyone's favorite instrument, the bubble accordion! Our hard-boiled detectives gather for a briefing with Police Chief Andrea from the AAHOM precinct. Who will solve the mystery?! 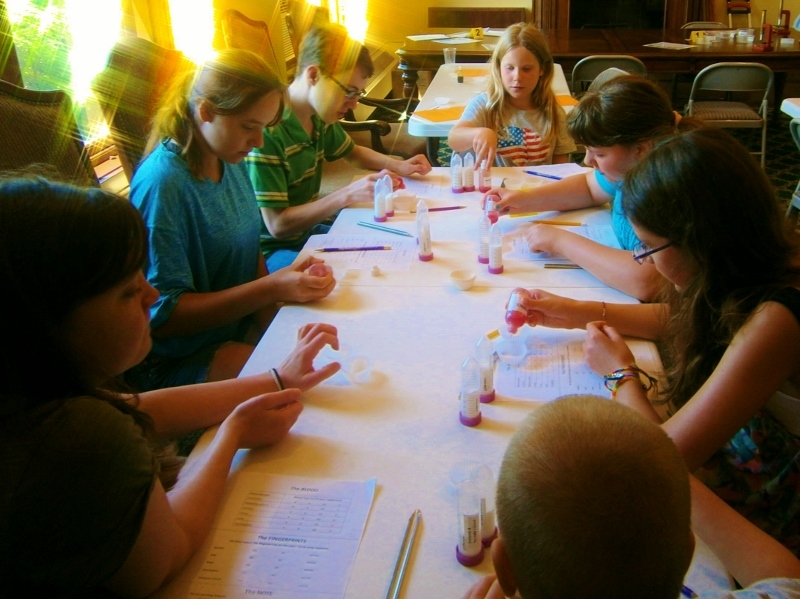 Crime Lab participants going over the evidence. Justice will prevail! 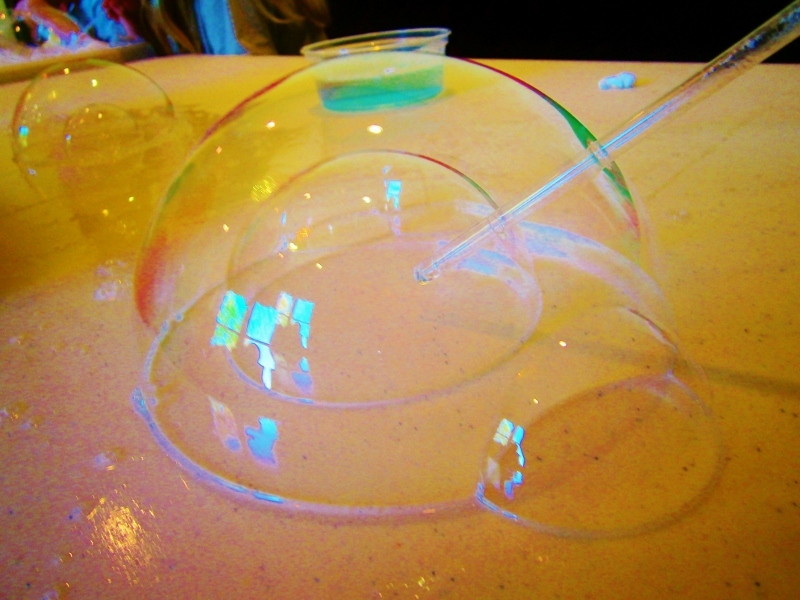 Bubbles aren't just sciencey--they can be artistic too! Look at this sculpture of a cut-in-half basketball inside of a tiny igloo. Brilliant! 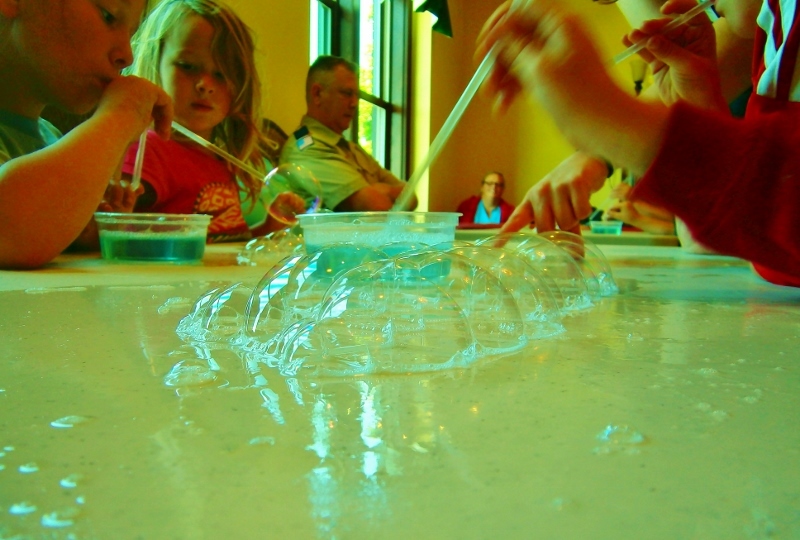 Did you enjoy our Super Science Day? 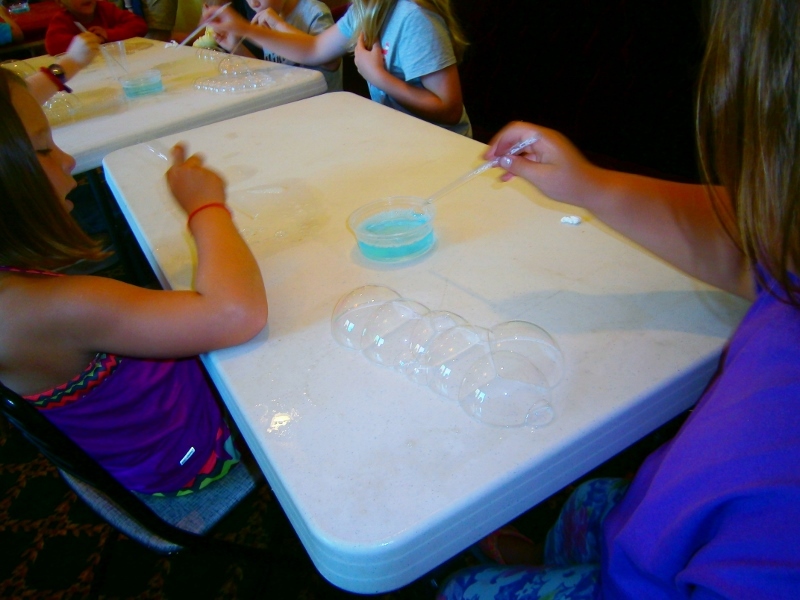 Would you like to see more science workshops next summer? Share your thoughts on our Facebook page! Robert Anthony Salvatore (pen name RA Salvatore) was born in January 1959 in Leominster, Massachusetts. He is the youngest of five children and a graduate of Leominster High School. After graduating he went to Fitchburg State College in MA where he planned on studying computer science. But, after receiving the book “Lord of the Rings” as a Christmas present his sophomore year he switched majors and graduated with a Bachelor of Science Degree in Communications/Media from Fitchburg in 1981. He went back the following year and earned a Bachelor of Arts in English. Before taking up writing full-time in 1982, he worked as a bouncer and contributes his fierce and vividly described battle scenes to his time as a bouncer. Judith Ann Jance (JA Jance) was born in South Dakota in 1944 and raised in Bisbee, AZ. As a second-grader Jance was introduced to Frank Baum’s “Wizard of Oz” series and from that moment on she knew she wanted to be a writer. She graduated from Bisbee High School in 1962, and received an academic scholarship that made her the first person in her family to attend a four year college. She graduated in 1966 with a degree in English and Secondary Education from the University of Arizona. While in college she tried to pursue her writing career by taking a creative writing class, but the professor refused her entry into the class due to her gender because women weren't writers, they were “teachers or nurses.” While in college she married an alcoholic and in 1968 he forbade her from writing because there was only room for one writer in the family and that would be him. In the end nothing he ever wrote was published. However, she continued to write poetry in secret, but never seriously perused a writing career until much later in life. Please note that we have officially entered "summer hours" where computer use is concerned. Computer sessions are limited to 30 minutes; no exceptions. If there are available computers after you have signed out and given others a reasonable chance to log on, additional sessions may be available. If these rules are not followed, it may result in computer priveleges being restricted or revoked. If everyone follows the rules and uses common sense and fairness, we can keep our public computer system simple and accessible. Thank you for your help in ensuring that all of our patrons and visitors are able to get online during this busy time of year. "We are all getting along and sharing the computers fairly! Hooray for the library! Hooray for summer! Hooray for stock photography!" Jonathan Kellerman was born in 1949, in York City to an aerospace engineer/inventor father and a dancer/office manager mother. When he was still young the family moved to LA where he grew up. He worked his way through college as a cartoonist, illustrator, journalist, editor, and guitar instructor until he received his BA in psychology from UCLA in 1971. He enrolled in a PhD program in clinical psychology at the University of Southern California and received his PhD in 1974 at the age of twenty-four. His doctoral research was on attribution of blame for childhood psychopathology and he published a scientific paper on that topic at the age of twenty-two. In 1975, Jonathan was asked by the USC hospital to research the psychological effects of extreme isolation on children with cancer and to coordinate the care of the children and their families. From this research the hospital established the Psychosocial Program, a Division of Oncology in 1977. It was the first in the world that approached the emotional aspects of pediatric cancer. He was a practicing psychologist until he gave up his practice in 1987 to focus on his writing career. Jeffrey Deaver was born outside in Glen Ellyn, Illinois near Chicago in May 1950. He has a bachelor degree with a major in journalism from the University of Missouri and a law degree from Fordham University. During his life he has worked as a journalist, a folksinger, and a corporate attorney before becoming a bestselling author. He has a sister who is also an author of young adult novels, Julie Reece Deaver. In his free time Jeff likes to speak at conferences and festivals about books, literacy, and writing in general. He is also a cook and loves to have dinner parties with some unusual themes, such as Roman medieval. Jeff has said he has always wanted to be an author and even wrote his first book at age eleven. He has written over thirty novels, three short story collections, and a nonfiction law book. Jeff's novels are suspense filled fast paced stories that usual only cover a very short time frame of only hours or days. Even though most of his stories are plot driven, he is able to present the human side of his characters and include human issues into the stories. The stories feature strong and sometimes flawed heroes, deranged bad guys and are full of surprising twists and turns with oodles of cliffhangers. His books explore the psychology of crime and crime detection with insights into not only the hero’s minds, but the villains as well. There is also a great deal of forensics and standard police work that go into his books to make thrilling crime stories that you just can't put down. To come up with ideas for his novels Jeff does not peruse the news headlines. Instead he spends his time in a dark room thinking of stories and characters that would fit into a typical Jeffrey Deaver novel. After coming up with a story he likes he then spends about eight months researching and outlining his book. When he is ready to begin writing he will sit in a dark room and picture the scene he is about to write. Once he has it, he closes his eyes and begins touch typing the scene. He then goes on to revise his novels twenty to thirty times before he even sends in his manuscript to his publisher. He has never taken any writing classes and believes the best way to learn to write is to study the work of other writers that you like. Jeffrey primarily writes two thriller series. The first and most popular series is the “Lincoln Rhyme” series featuring a quadriplegic New York detective and the other “Kathryn Dance” series featuring Dance as an agent with the California Bureau of Investigation. His latest novel “Solitude Creek” released in May 2015 is the fourth in the Dance series and has Dance investigating a possible serial killer that uses panic and the chaos it creates to kill people. If you are a fan of any of these thrilling crime writing authors Jonathon Kellerman, Boris Starling, Michael Connelly, John Sandford, Tess Gerritsen, Karin Slaughter, or Jefferson Bass you should give Jeffrey Deaver a try. His psychologically in depth novels with plenty of plot twists and carnage will provide you with a roller coaster thrill ride where you aren't quite sure who you are rooting for in the end, the hero or the villain.